By now you probably know that when you sign up for Voxox, you get your very own free phone number right along with it. Now most of us love this because with Voxox’s Internet-based number, you can receive free phone calls from anywhere in the world; make dirt cheap international calls and even cheaper domestic calls (1 cent per minute in U.S./Canada); and do two-way worldwide texting and fax. Send the caller to voicemail, and let you Eavesdrop™ on the message as its being left – you can pick up at any time, just like those retro answering machines from the 90s! Sold yet? Check out the instructions below, and remember, this is for Voxox power users! The instructions are a little tricky, but they work! We tried this with our CEO who has AT&T and he loves it. This part is slightly different with every mobile carrier, but fairly simple to do and undo. Below are the basic instructions, but if you have any specific questions, contact your cell phone carrier. To undo, dial ##004# on your cell phone and press send. With Verizon, dial *71YOURVOXOXNUMBER on your cell and press send (Example: *713335554444); To undo, dial *73 and press send. With Sprint, dial *28YOURVOXOXNUMBER on your cell and press send (Example: *283335554444); To undo, dial *38 and press send. With T -Mobile, dial *004*1YOURVOXOXNUMBER# on your cell and press send (Example: *004*13335554444#); To undo, dial ##004# and press send. Note: From our research, T -Mobile seems to allow only 500 minutes of call forwarding before they charge you a fee. You’ve followed the above instructions. Now, anytime someone calls your cell phone number, you will first hear a couple of rings on your mobile -- don’t pick up. The ringing will pause for several seconds (to you it will look like you missed a call, but don’t panic, the phone will ring again). When the ringing resumes, this means that Voxox has kicked in, so pick up and have some Voxox fun! 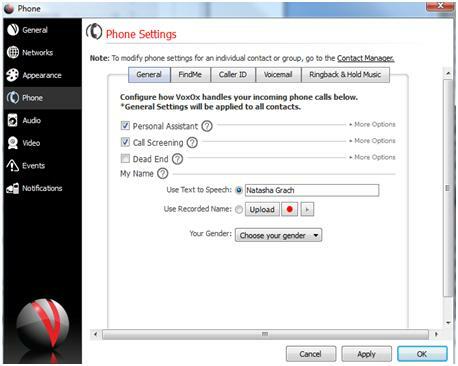 As mentioned above, you can screen calls, “Eavesdrop,” record conversations, transfer your call on-the-fly, and more. Once you’ve forwarded your mobile phone number to Voxox, all your voicemails will now be stored in Voxox. They are accessible online and via phone. You will be notified by text message when you have a new voicemail. Go to Notifications in (Tools -> Settings -> Notifications) and make sure that your voicemail notifications by email and text are check marked. 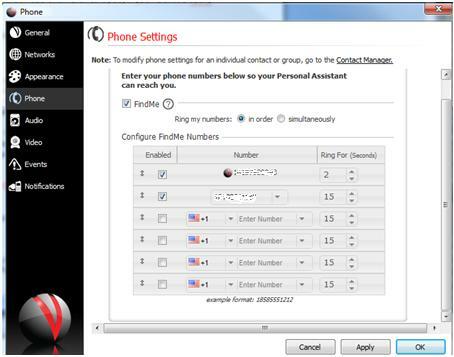 If you want to retrieve messages via phone, set up your 4 digit pin code (Tools -> Settings -> Phone -> Voicemail). Once you’re set up, you can call your Voxox number anytime and press *PIN# (ex. *5555#) and you’ll get various options, including voicemail. So there you go! Just another way that Voxox works hard for our loyal users. Try it and comment to let us know what you think.